Just days before a showdown in the California Legislature over when police can use deadly force, law enforcement groups are embracing reforms recommended by Attorney General Xavier Becerra after the Sacramento police shooting of Stephon Clark. Capital Public Radio’s Ben Adler reports. There are two rival use-of-force bills at the state Capitol. One, backed by civil liberties advocates and community activists, would strengthen the legal standard for when police officers can use deadly force from “reasonable” to “necessary.” The other, pushed by law enforcement groups, would leave the “reasonable” standard in place but increase training for state and local law enforcement agencies. And it’s that second bill that’s getting amendments. Democratic Senator Anna Caballero says she’s amending her bill to include best practices from progressive cities nationwide — and almost all of the attorney general’s recommendations. So far, there’s been no committee hearing set for Caballero’s bill. The other measure faces its first committee vote on Tuesday. There’s a sense at the Capitol that it’s short on votes, but Democratic Assemblywoman Shirley Weber says she’s “optimistic” her bill will advance without major amendments. 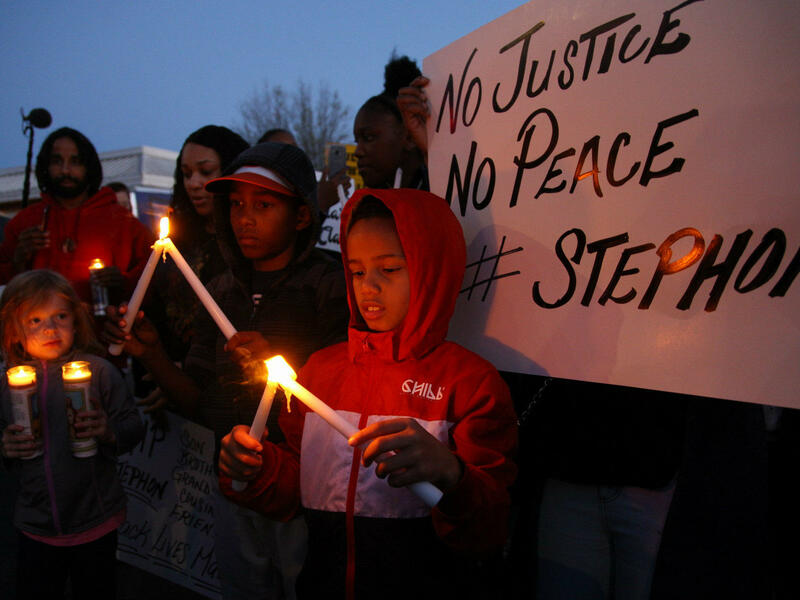 People gather for a vigil for Stephon Clark shortly after the Sacramento man was shot and killed by police in his grandmother's back yard. At the state Capitol, I’m Ben Adler. A First Amendment group is suing California Attorney General Xavier Becerra over his refusal to disclose police records. Capital Public Radio's Nick Miller explains the lawsuit will impact law enforcement transparency in cities across the state. California lawmakers are proposing to change when police can use deadly force. That's after the shooting last month in Sacramento of Stephon Clark, an unarmed black man, was the latest to cause widespread protests. Capital Public Radio's Ben Bradford reports. A bill requiring California police departments to report officer-involved shootings to the state is awaiting approval from Governor Jerry Brown. Capital Public Radio's Marnette Federis reports. The California State Senate approved a bill this week that would eliminate the use of the Grand Jury in cases pertaining to officer-involved shootings, or cases where excessive force used by an officer results in the death of a suspect. KVCR's Natalya Estrada has details.